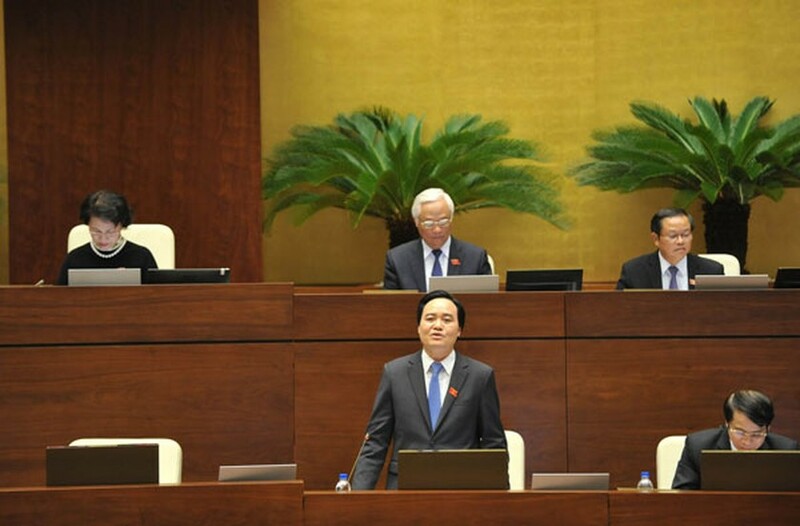 Fifty eight National Assembly deputies questioned Minister of Education and Training Phung Xuan Nha at the NA question and answer session this morning November 16 when the minister affirmed that the country’s foreign language project by 2020 has failed to obtain its targets. Before answering questions, Minister Phung Xuan Nha admitted that despite many efforts, the education and training sector has failed to meet citizens’ expectations with many existing limitations and weaknesses. Making the first question, deputy Duong Minh Anh from Hanoi said that according to the national foreign language project by 2020, most Vietnamese youth would be able to use foreign language to work independently. So far, VND5 trillion (US$223.46 million) out of the total capital of VND9 trillion for the project has been spent but many targets have been unobtainable. In response, the minister affirmed the unobtainable targets saying foreign language teaching and learning needs to have a longer time. The project’s implementation has been unsuccessful because of many difficulties in time, expense and teacher staff. The project’s target to train foreign languages for all Vietnamese youth was unfeasible, he said. The ministry has learned from experience and reviewed the project to adjust targets. It will focus on training the staff of foreign language teachers via online and distance teaching methods. Foreign language learning must be the motivation of the entire society not only students and the education sector, he said. The ministry will work with the Ministry of Home Affairs to change foreign language requirements to civil servants and teachers. According to deputy Ho Thi Minh from Quang Tri province, 191,000 students are unemployed after graduating from universities now while schools continue enrolling. So she expressed concern about the employment of new graduates and wondered if the schools should maintain their wasteful training. Mr. Nha answered that the issue was also his concern when taking up office. At present, over 300,000 students finish universities a year with 80 percent able to find jobs and the remaining of 60,000 unemployed. Most of the unemployed graduated from low quality and newly established universities and colleges. Therefore, in the upcoming time the ministry would intensify amending the university and college plan to improve education and training quality, Mr. Nha said. In addition, the ministry would limit upgrading colleges and vocational schools into universities and rampant university establishment in localities, tighten entrance quality and increase graduate standards, he said. Many deputies argued that most of the 191,000 unemployed students are bachelors and many are post-university graduates. The issue has been because training quality has been low, training has not been in accordance with labor market demand and the university and college plan is uunsuitable. The Ministry of Education and Training and the Ministry of Labor, Invalids and Social Affairs have not worked together in training and employment and yet to be able to forecast labor market, they stated. Mr. Nha said that the ministry took responsibility for substandard training phases and admitted the short coordination between the two ministries to link education up to employment. Deputy Cao Thi Xuan from Thanh Hoa province asked the ministry about low training quality, tutoring and school violence. Mr. Nha admitted that educational quality has been weak partly because curriculums have not accorded with labor market requirements, focused on academic instead of practical knowledge and other skills. Hence most graduates have been weak at foreign languages, IT and life knowledge. The ministry has required universities and colleges to get businesses’ opinions when building their curriculums. However the ministry has not closely followed the schools on how they implemented the requirement so it will intensify supervision in the upcoming time. He also took responsibility for another issue in which the college-going rate of high school graduates reaches as high as 75 percent. Only 15 percent choose to learn a trade and go other ways. The Prime Minister has issued a national curriculum framework requiring educational stages to have connectivity to tackle the issue. Besides the framework, the general education curriculum will be reformed for the purpose, Minister Nha said. Admitting increasing school violence, he said that the ministry had sped up moral education for students and put civic education subject into the national high-school final in 2017. Talking about examination reform, Mr. Nha said that the ministry had applied many models for recent years and would continue reforming exam method in 2017 to make it more order and efficient. Answering deputies’ query why the ministry carries out the reform every year, the minister said it had been conducted little by little and year by year to prevent social shocks. 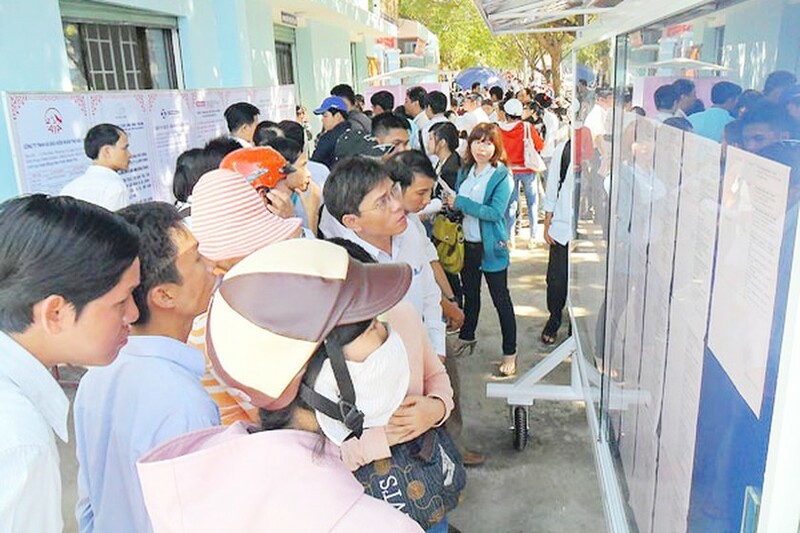 Deputy Nguyen Thi Kim Thuy from Da Nang city made a question that if the controversial set of education technology books has been assessed by a national council before being put into the first-grade curriculum in 48 provinces and cities. Mr. Nha answered that the controversial set of book is a social problem which the ministry has been aware of and reviewing to have adjustments.